I met Dana Reed when I moved to Jonesborough, Tennessee in 2003. “Coach,” as they called him, since he had been a coach for more than a generation of young people in the schools of Washington County, Tennessee, was grinning the moment I met him, and there was a sparkle of grace in his eyes. He came to the parsonage when we moved in, and was part of a group of guys who were trying to get some things done to the house so we could make it a home. One of the things they were doing was putting in a new wood floor in the den and kitchen. There were some leftover boards in the garage, and Coach took a few of them home with him. Said he had something he wanted to do with them. I told him that was fine. I was the new guy and I wasn’t going to go against anybody, since I wanted things to go well. 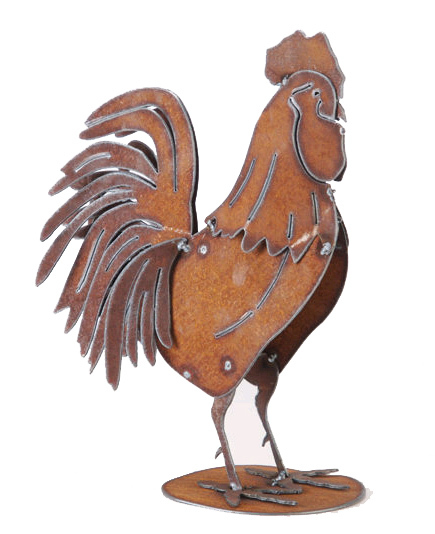 In the conversation, my wife let him know some things had been broken in the move, and one of these things being a metal rooster I had collected at the previous place, he took notice and gladly took it to his “tinkering” place where he promised he’d work on getting it fixed. I figured I might never see it again, and was willing to part with it, since it was just one among many of my collection (having received them from a group of people in the previous church who had been taking delight in making sure I got them). I rode around the neighborhood with Coach a while one afternoon. He wanted to tell me about different things, like the airport on 107 and the site of the old pottery which was near his homeplace. In the seat between us was a box or two of fried pies. He offered me one, and I refused it since I didn’t need the calories, but he just kept grinning, and soon we went through a road block where the state workers were repairing a piece of the road. He hollered at the flag man and reached and handed him some pies, and asked him if he needed water. I was amazed at the delight he was taking in offering this hospitality. I came to find that Coach Reed had a ministry of taking old wheel chairs and fixing them up to give to people who needed them. He had a place where he worked on these things and spent a lot of time there. But getting them done wasn’t his aim as much as meeting people, telling stories, and grinning. One day I was walking through the church before service and Coach was sitting beside a Mr Slonaker, and he was sharing his trademark grin. So I stopped and shook hands with these men and welcomed them to the service. Coach looked up and said, “Preacher!” Without missing a beat he continued: “Slonaker and I are going over to the Army-Navy Surplus Store this week to look for some blankets.” I thought he must have some sweet ministry he was wanting to do that involved blankets. I wanted to hear about this so I asked him what for? That delighted him further, and his grin got bigger, then he stated: “Yeah, it’s so cold in this sanctuary with the air conditioner running we need them to stay warm!” Still grinning at me, I could only laugh and tell him my trademark statement: “Coach,” I said, “There’s two things I refuse to learn how to do: 1. work the sound system, and 2. mess with the thermostat.” But I never forgot the sheer delight he took in telling me that, dressed in his best shorts and polo shirt. So as you can see, this special man was involved in a lot of things. He was one of Jonesborough’s greatest storytellers, although he never took to the stage. His stories were personal and he delighted to be in anyone’s presence. It wasn’t long after this that I found myself at a graveside, trying to say appropriate words about the life of this man who loved people so much. Before he died he presented me with two picture frames he made from those boards he took from the parsonage. I have one in my office today, to help me remember the hospitality of one of God’s saints. This entry was posted in Uncategorized and tagged air port, apple pie, army-navy surplus, broken rooster, Coach, delight, donkey cross, East Tennessee, fried pie, grin, head rooster, Hospitality, ministry, pottery, rooster, story, storytelling. Bookmark the permalink.